The Shirley Ground Mondo Track was bathed in late afternoon sunshine as, after the Opening Ceremony featuring remarks from the President of NACAC, Mr. Victor Lopez among others and a beautifully presented Territorial Dance, the Women’s Long Jump got the competition underway. Whitney Gipson won the event with a new All Comers Record of 6.42m ahead of Chantel Malone’s 6.29 and Wanetta Kirby’s 6.06. On the Track, Jermaine Brown, a member of Jamaica’s world record-breaking 4x2 team in Bahamas last month, topped the men’s 200m in 20.46secs. United States' Sean McLean was second in 20.49 and Rolando Palacios, third in 20.69. Brijesh Lawrence of St. Kitts and Nevis finished 4th in 20.71secs. Anastacia Le-Roy of Jamaica took victory in the women’s 400m. She crossed the finish line in 51.62 to beat Kineke Alexander of St. Vincent 51.78. Bahamas' former World and Youth 400m champion Shaunae Miller, a 200m finalist at last year’s senior World Championships, finished third in 52.60. Ashley Kelly finished with a time of 53.43 just behind the USVI’s Allison Peters who ran 53.34. 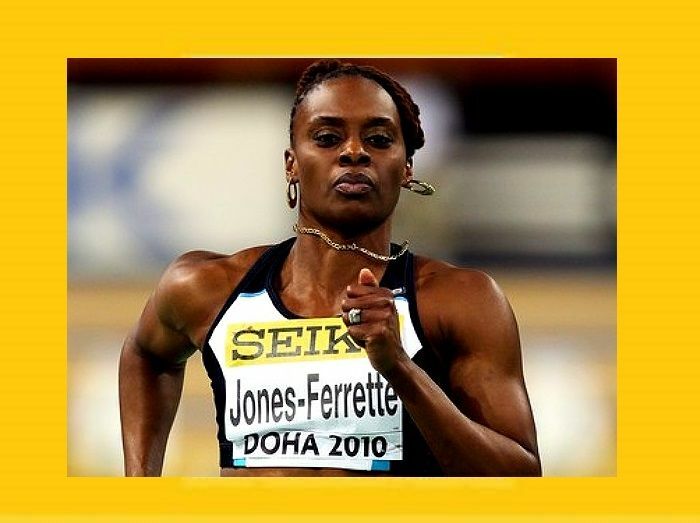 Peters won the women’s 200m in 23.41 ahead of Alexander 23.55 and Jade Bailey of Barbados 23.62. Karene King finished 4th in a time of 23.83, Tahesia Harrigan-Scott ran 23.91 and Kelly 24.02. In the Women’s 100m Harrigan-Scott grabbed third in a time of 11.57 behind Jade Bailey (11.37) and winner Tawanna Meadows of the USA (11.28). “The race was ok, I felt really good, but you win some you lose some, the first part of my execution was good, the second part not as good as I got a little tight in my shoulders but overall I feel really good,” said Harrigan-Scott. Guyana’s Adam Harris ran into a negative 1.3m/s wind to win the men’s 100m in 10.23 ahead of Lawrence 10.38 and Ivory Williams of USA 10.49secs. In the men’s 400m, USA’s Torrington Lawrence upstaged the Caribbean men, Tabarie Henry of USVI (45.75) and Bahamian Chris Brown (45.77) to win in 45.45. The 800’s went to Tayron Reyes of the Dominican Republic and Kimarra MacDonald (USA), who held of Alena Brook (Trinidad) at the line to win in a time of 2:06.12. The Meet was punctuated with a whole slew of Junior Events including an awe inspiring run in the Girls U20 100m when Nelda Huggins blew away her previous Junior Record to win in a new low time of 11.59, well ahead of L’Tsha Fahie (12.01 and a new PB) and Taylor Hill in 12.12. Huggins’ time would have placed her 4th overall amongst the Senior Women, just 0.02 behind Harrigan-Scott. Beyonce Defreitas won the 400m in a time of 56.82 with Judine Lacey 2nd in 57.73 and Kelsha Fortune third in 58.35. Izariah Frett took home top spot in the U11 100 with a time of 28.44 ahead of Aria Smith (29.16) and Abriel Magliore (29.22). Zara Brown won the U13 200m with her time of 27.15; Xiomora Malone came 2nd in 27.50 and Alisha Hayde 3rd in 27.55. Amongst the Young Boys, Shael Lavacia (26.96) led home Kyron Walwyn (28.43) and Kyba Dawson (28.59) in the U11 200m. J’Quann Smith won the U13’s race ahead of Koen Penn and Jelani Norman the U15’s in 24.52. Kyron McMaster took first place in the U20 400 in 48.45 with Malique Smith (USVI) 2nd in 50.44 and Graham Coull (Antigua) 3rd in 50.97. ROAD TOWN, Tortola, VI – The finishing touches are almost completed, the seating is in place, the tickets are selling fast and the athletes are ready to renew friendly rivalries and establish some fast times as the 2nd BVI Twilight Invitational gets underway on the A.O. Shirley Ground this afternoon, Saturday June 7, 2014. Elite athletes such as Christopher Brown - who took time out of his schedule on Friday to talk to Students at Althea Scatliffe Primary School - Shaunae Miller, the new Bahamian sensation, Laverne Jones, Joanna Atkins, Whitney Gipson and many others will be running and leaping against local stars such as Tahesia Harrigan-Scott, Chantel Malone, Ashley Kelly and Karene King. 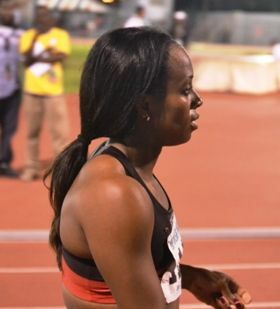 Geronne Black from Trinidad is also competing and is looking forward to a fast time in the 100m where she will be up against new Club Mate, Harrigan-Scott and also fellow Portland State Alumni, Karene King. Black is looking for a Season Best time of around 11.29, which would put her well in the mix for a top three finish. Harrigan-Scott, who ran 11.27 last weekend, will be running against long standing Virgin Islands rival Jones and is injury free so spectators will be able to see something special unfold down the straight tonight. Other local athletes competing include Shaquoy Stevens who also runs in the 100m and will up against Chevaughn Walsh from Antigua, Sean McLean (USA) and Brijesh Lawrence from St Kitts. Steve Augustine is Chairman of the Organising Committee and is very pleased with the buildup. Augustine also promised that spectators would witness a fantastic night of top level competition. the turn out only tell 30% of the story . Wonderful. But please may I have my relays back. I second that! Organizers please send out the invitations to the various countries very early for next year's event, that way the countries will be able to plan to send more athletes to compete in the relays. Great job though! I am looking forward to next year's event. Who has a track and field event without relays? I was very disappointed. Well done organizers. Small BVI doing good things. Congrats to all the athletes. They had fun I am sure. win or lose. Congrats to the Top Notch Track Club. You all did very well and most of you with PB's. Fastman Lavacia, Kyron, Kybah, Izariah Pepper Foot, Abriel, Xiomara Gia, Koen, Jaheem, Diamanté, Niquan, Shaian, Kala, Kelsha, Bradshaw, Ebenezer, Royce u did good. Keep striving for excellence. Excellent run by Beyonce and Nelda among others. These two are the future Chantel and Tahesia but even better. They will be World Class from the VI. Remember it was said here !